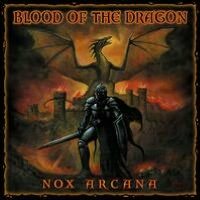 From the band Nox Arcana comes a CD of 21 riveting tracks of epic fantasy music. This is a CD that tells the tale of warriors battling with dragons and sorcerers to overtake a magical castle, and, track by track, the listener can follow their progress through brisk battle and quiet reprieves, until the CD ends in a definitive and shattering conclusion with a powerful, drum-filled finale. The music on this CD is nothing less than purely exciting. It is comparable to the movie score from a widescreen, action-packed fantasy movie. With the main instruments being things such as booming drums, wild war trumpets and horns, and the throaty roaring of men and dragons, the music instantly plunges the listener into a very vivid and real world of epic fantasy warfare — swords clashing, magic crackling, and, somewhere overhead, a dragon hissing flame. The music sweeps up and down in strong, stringed shudders, letting the listener envision dragon wings on the wind. Most tracks move forward quickly, with invigorating beats, crisp gongs ringing out through the thickness of the battle’s rhythm. Occasionally, however, the pace of the war slows down, enough for the listener to catch a breath and drink a little ale in a cozy inn. Here is where a bard sings to us, accompanied by his instruments. At times it is just one lonely lyre all on its own, strumming away at a melancholy but plucky rogue melody, a beautiful contrast to the heat of combat. I could see this music very easily belonging to a famous movie or a video/roleplaying game, or perhaps even for those who like to exercise to vigorous music. Nox Arcana’s creations are also usually very excellent for writers to listen to while they are indulging in their creative work. Nox Arcana’s other CDs are very good for this task, but I felt that this CD’s overall tone was too powerful and strong to be suitable for a writer to listen to while actually writing. The heavy drums, as well as the lyrical singing on some tracks, could be overbearingly distracting when someone is trying to focus on bringing new words to life. However, the CD would be good for warming up to a fantasy writing session — it would boil the writer’s blood and bring images of dragons and warriors to the surface! My personal favorites from the CD were “Rogue Hollow” and “Sorcerer.” “Rogue Hollow”, the track in which we are lulled to sleep by a peaceful, gentle lyre, is indescribably and breathtakingly beautiful. The simple little melody is a sliver of great grace and tranquility amidst pummeling wings and stomping feet. This contrast does extra justice to the CD by intensifying the talent and skill with which the other tracks were put together. “Sorcerer”, a track which most likely describes warriors meeting a sorcerer in battle, is just livid and leaping with the sting of magic. Nothing would be better for getting in the mood for writing action-packed scenes than listening to that track.